This set consists of 4 hook-fitting blades and 2 interchangeable handles: one plastic-covered straight aluminium handle and one traditional straight rattan-wound wooden handle, as shown in the picture above. (Handle colour may vary). The selection of blades provides something for cross-cutting and for rip-cutting as well as a universal blade for everyday use. An ideal present for anyone undertaking regular construction-type work. You won't find anyone else in the UK selling these tools, and my exclusive price for this package is £86.40 (RRP £93.30). H-300 rip: The only choice when you need to cut with the grain of the wood. The graduated teeth make cutting fast and clean. 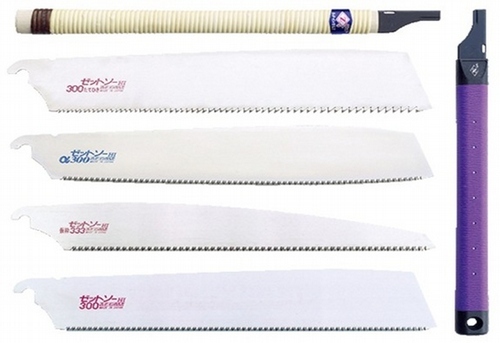 Blade length 300 mm, thickness 0.66 mm, kerf 0.93 mm. H-300 cross convex: With 12 TPI and a convex blade this is designed for fast cross-cutting of timber but will leave a very smooth cut edge. 300 mm long, 0.7 mm thick with a 1 mm kerf. H-300 universal: Good for everyday use, this blade will cut on the slant as well as across or with the grain of the wood, and will leave a very smooth cut edge in any direction. 12 TPI, 300 mm long, 0.7 mm thick with a 1.07 mm kerf. H-333 framing: A very fast-cutting saw with 9 TPI, this 333 mm-long blade really cuts through timber, but still leaves a much smoother edge than an equivalent Western-style saw.